Bournemouth manager Eddie Howe has contacted referees' chief Mike Riley for clarification over Liverpool's controversial winning goal against his side - but is yet to hear back. 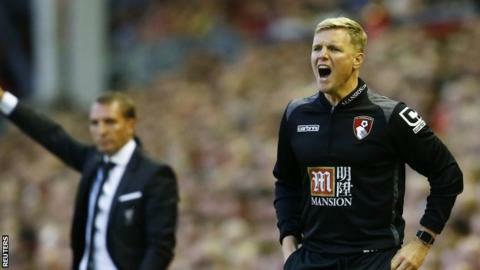 Howe was "baffled" after Christian Benteke's goal was allowed to stand in the Reds' 1-0 win at Anfield on Monday. The 37-year-old also wants to ask Riley about a disallowed Bournemouth goal. "I'm definitely keen to have a conversation and see their perspective," he said. "I have made a call. I'm expecting a call back." Benteke turned home the only goal of Monday's game from close range - but Philippe Coutinho was offside as he also tried to reach Jordan Henderson's cross. Earlier, Cherries defender Tommy Elphick had a header ruled out for a foul. Speaking after the game, Howe described the decisions as "unforgiving" and added: "The two big ones have cost us points." On Thursday, he acknowledged officials have a "tough job", adding: "They have a split second to make a decision so I respect that and the challenge their job brings. "We felt we were on the wrong end of not just the two big decisions in the game but there were several other little things that went against us." Speaking before his side's visit to West Ham United on Saturday (15:00 BST), Howe also said there was "no truth" to reports he wanted to sign Sunderland striker Jermain Defoe.